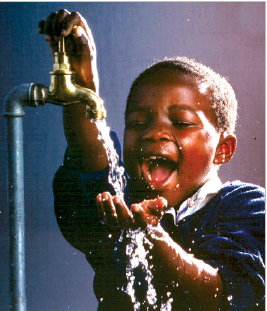 The primary activity of Umgeni Water, as pronounced in Section 29 of the Water Services Act, is to provide water services to other water services institutions in its service area.In addition, Section 30 of the Water Services Act enables Umgeni Water to undertake other activities, provided these do not impact negatively on the organisation's ability to perform its primary function.  An additional fourteen small water treatment works and ten borehole schemes are managed on behalf of the iLembe District Municipality. The organisation also treats bulk wastewater totalling 31.8 million cubic metres per annum (87 Ml/d) and in support of this operates five wastewater treatment works.  Expansion into the North of KwaZulu-Natal to include the district municipalities of uThukela, Umzinyathi, Amajuba and Newcastle Local Municipality.  Expansion into the Eastern Cape to include the Alfred Nzo District Municipality and the Ngquza Hill Local Municipality, within the OR Tambo District Municipality. The primary function of the proposed Umgeni Regional Water Utility (URWU) will be to plan, construct, operate and maintain regional bulk infrastructure. The URWU will take on more responsibility for regional water resources infrastructure to achieve greater integration with bulk systems. In addition, the URWU will provide support functions to municipalities as a secondary activity. With the proposed change, the operational area will increase to 70 701km2 with population of approximately nine million people and households will increase from 1.64 million to 2.28 million. In respect of the expansion, Umgeni Water has finalised its due diligence exercise and in the coming period will develop and implement plans for the provision of sustainable regional water services to the new customer areas. In the midst of impending changes, Umgeni Water commemorated its 40th anniversary in the financial year 2014 - 2015. Activities in this regard included the launch of a book on 40 years of Umgeni Water; a Dam Safety Community Event; VIP banquet for stakeholders, an Umgeni Water-Stakeholders Golf Day and Water Resources and Innovation Conference. Another significant event occurred in 2014 - 2015: the onset of a drought as a consequence of the El Nino effect. At least two parts of the Umgeni Water operational area have been affected by the drought. They are the north of eThekwini and parts of the iLembe District, and the Middle South Coast. At the time of preparation of this report the source of supply to the north of eThekwini and iLembe District - Hazelmere Dam - was at a critically low level. This has resulted in a 30% curtailment in the production of potable water and the imposition of water restrictions and rationing by the affected Water Services Providers. In an endeavour to mitigate the impact of water shortages, Umgeni Water constructed and financed, at a cost of R38 million, an emergency water scheme, comprising a pipeline and pump station, that has begun transferring water from the uThongathi River to Hazelmere Dam. Provide innovative sustainable, effective and affordable bulk water and sanitation services.